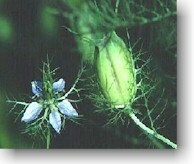 The first major study of Nigella sativa in cancer prevention and treatment was performed by scientists at Cancer Immuno-Biology Laboratory of Hilton Head Island, South Carolina. They concluded that a healthy immune system will detect and destroy cancer cells before the cancer endangers the patient. The immune system does this by supporting increased production of immune cells, bone marrow cells, and B-cells that produce antibodies. Black cumin stimulates neutrophil activity. These are the short-lived immune cells that are normally found in bone marrow but mobilized into action when there is a bacterial infection. Extracts of black cumin have also been shown to modulate production of interleukins, a quality it shares with some other highly revered herbs: ginseng, astragalus, mistletoe, garlic, and cat's claw. Most people seeking the benefits of black cumin take the oil in capsule form. Over a period of time, usually a few months, the hair and fingernails are strengthened and have more luster. However, some people use the oil externally, for beauty as well as for treating skin conditions such as psoriasis and eczema. One can buy a ready-made cream, add some oil to a favorite cream, or make one's own cream from scratch by warming equal parts (by volume) of black cumin seeds and a nice carrier oil, like shea butter or jojoba. It's best to use a double boiler or be lazy (like me) and use a yogurt maker because the temperature is very even so you can safely ignore the process for hours. The oil will darken. When you feel this has been warmed long enough, melt a little beeswax into the warm oil. Stir it with a glass rod or new chopstick. If you like, you can add an essential oil or combination of oils just before the beeswax stiffens. Choose this for aesthetic or health reasons. Some people use such mixtures on burns or skin infections; some just use these creams to feel good, moisturize the skin, relieve joint or pain, or make wrinkles vanish.